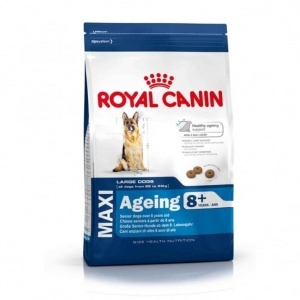 Royal Canin Maxi Ageing 8+ helps support health ageing in senior dogs over 8 years old. Contains EPA-DHA and an exclusive complex of antioxidants to help neutralise free radicals. A highly digestible formula containing fibre and protein. Helps maintain healthy joints in senior large dogs. Contains nutrients that give a shiny coat and healthy skin. ANALYTICAL CONSTITUENTS: Protein: 27% - Fat content: 17% - Crude ash: 5.7% - Crude fibres: 2.7% - EPA/DHA: 4 g/kg.